So where have I been hiding? This is my first post in almost two months and I'm really sorry that I've been away, but I have been sewing. I went on a quest to get a better fit. I was looking back at all my makes since I started sewing and found that they all had the same problem. There was always a lot of extra material in the back. I always measured twice (and sometimes more), checked the packet and chose the appropriate size yet my makes were only looking good from the front. So this began to bother me. What was the point in spending all that time making something if ultimately the fit would be better from ready to wear. Well I decided that I needed to understand pattern making better and drafted myself a skirt using Cal Patches book. I know, when I look back I can clearly see that having a well fitted skirt pattern was not going to solve the problem that was affecting my tops and dresses. The process was really fun and I did create my own skirt self drafted pattern. This taught me a lot about basic construction which led me to realising that the measurements I was taking averaged out the circumference of the body (the body could be split into quarters - not literally ouch) My body would need significantly more fabric for the front than the back. This was a proper light bulb moment. 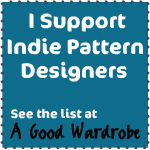 Well I then looked into narrow back adjustments and FBA and in one post realised that there might be a blogger body double (by this I mean someone who is a similar shape to me) who I could look up when I make patterns to see what adjustment they made - clever huh. Well imagine my excitement when I realised that my body shape is not that far off Lladybird. This is cool because not only is the stuff she makes similar to my style but also she is so prolific and adds loads of information. I feel that Lladybird may become my spiritual sewing guide - or at least it would mean that I will have a wearable wardrobe. I have also ordered a book that I can use to help with this issue - well loved by the blogging community. just hope it turns up soon. 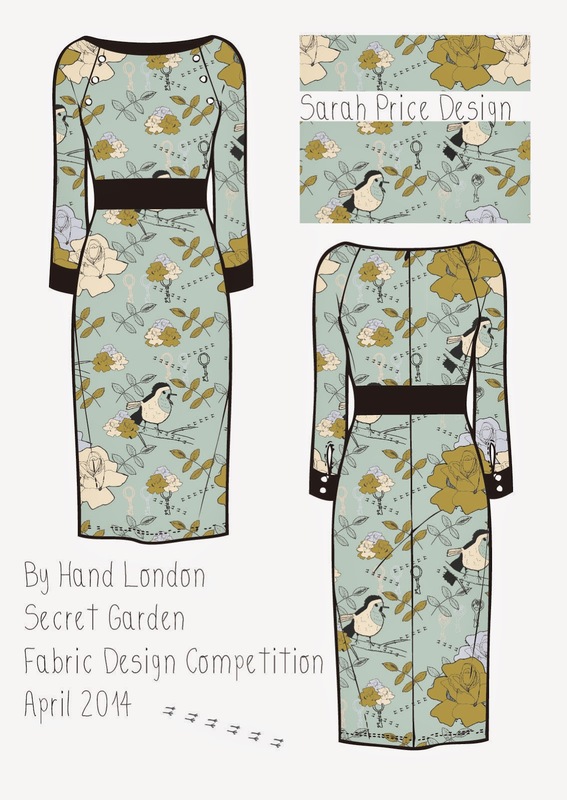 The exciting news that by Hand London had achieved their Kickstarter goal was only partly eclipsed for me by the launch of their Secret Garden Competition to find a fabric design that would be put up for sale on their site. I did enter with this design below. It wasn't shortlisted but was so fun to make I will be making up some more. I thought you may be interested to see the design I did. Well thats all and if you made it this far thank you. I will be reviewing Hazel by Colette patterns in my next post.